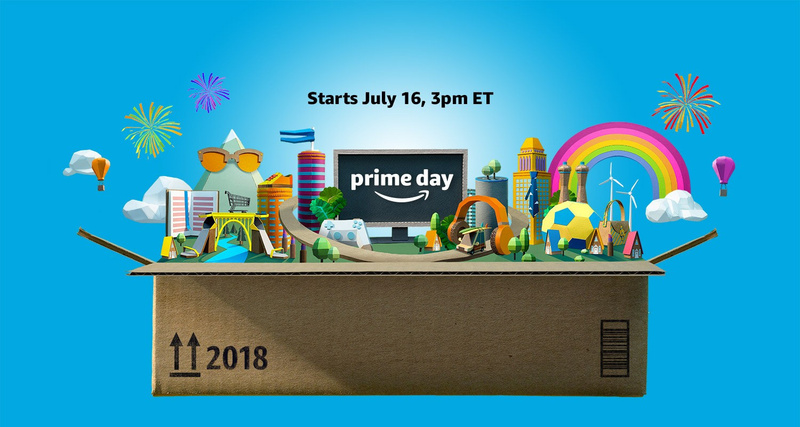 Deals: Amazon Prime Day Is Happening Now In The US, More Nintendo Switch Bargains On The Way? Amazon Prime Day kicks off today, giving buyers a whole day (and a half) to grab some crazy deals on the latest and greatest products - usually including lots of gaming goodies. The UK version of Amazon Prime Day started earlier on today - with two Nintendo Switch bundles and lots of games and accessories on offer - so we're hopeful for a similar showing for the US. If you spot any deals, make sure to throw a link to them in the comments for others in the community to see. Hopefully we can make sure that everyone gets what they're after by working together! If you're hoping to grab a bargain, good luck! Make sure to let us know what you manage to get your hands on below. Nintendo Switch Online subscription 50% off. @rjejr I wonder if something like that would result in more or less complaining about the impending online service? @HobbitGamer This is the internet, the answer is ALWAYS more complaining. If Amazon gave away the codes for free people would be mad they had to type the codes in and it wasn't applied automatically. No idea if I'll get anything, and if I do it won't be video game related. I'm low on money. @Dayton311 it's still a bit early for Aces, especially since it's already selling pretty well. Kirby is a definite possibilty though, along with the MK8, BOTW, and Odyssey at this point. Just wish I wasnt flat broke on my gaming budget this month. Hopefully Octopath Traveler gets knocked down to around $40 or less. That's pretty much the only deal I can take. ...but it's a pipe dream. @StephenYap3 considering it’s been out for a few days and is selling out, that is indeed a dream. They have a retail price system that comes with a 64GB microsd and a 20 dollar eshop card. I mean, nothing to write home about but surely if you need a system then you should buy it from Amazon at the moment. EDIT: I should mention I am from the US. Well, the system is crashing. I can't even see what deals they have because their servers can't handle the volume. @SuperWeird @ShadJV @Yosheel Interesting, that article doesn't even say why Amazon Spain is union striking. But a google search brought me to the (real name) Communist Party's union statement, which seemed to list grievances about 9-hour work days, lack of bonuses, and protection from diseases. I could be wrong, my Spanish isn't great anymore. But they have a Union that has apparently been working on negotiations for 4 months (I didn't say it was an effective union), whereas I do not have a union negotiating savings for my wallet. @HobbitGamer I dunno but I did notice the strike was based in Spain. Not to diminish their reasons, but I somehow doubt that boycotting the American branches of Amazon will do much for Spain. New 3ds xl snes $50 off. Tempting. Either these deals are mostly useless or the website is crashing. Or both. It'd be nice if the website was ACTUALLY working. @HobbitGamer yup same here. So frustrating. @HobbitGamer yep, looks like they are having issues. It's working better for me when logged in. I do wanna mention that both Sonic Forces and DragonBall Xenoverse 2 are on sale in the US if anyone is interested. @Agramonte I saw that PS+ UK offer this morning over on PS, I'll bite for $35, mine expires in January. We don't play online but I save a lot of money on sales and I play a lot of the included games. I won't pay $60, not gonna happen, but $35 I can do. Apparently the site is having problems now - haven't been on in a couple of hours - maybe Bezos can ask Alexa for help. I wonder if Amazon is getting DOS? Haven't heard anything from either Anonymous or the offshoot Lizard Squad in awhile. Best deal so far... A SNES Themed New 3DS XL for 50 dollars off. Amazon’s total compensation in Madrid is in the high range of the logistics sector and consists of base pay and an extensive benefits package: private medical insurance, a company pension plan, life assurance, employee discount and a Career Choice program that provides employees funding for adult education, offering to pre-pay 95 percent of tuition and associated fees for nationally recognized courses, over four years. Good reason for introducing more robots at the warehouses, at least they don't go on strike. So no, don't boycott Amazon, it's a silly thing to do. If workers don't like their job so much, just leave and find something else. @rjejr yeah - I always get mine on Sale. Either now or Black Friday. Even the Free PS+ pack for WarFrame is cool. I get mey money back always. @SuperWeird It is a shame all of those people that are being forced to work at Amazon against their will. @mateq People want to find a way to blame others for their life choices. There is nothing wrong with a job at Amazon but if you don't like the pay or conditions work somewhere else. If you don't qualify for anything else, whose fault is that? No Prime Day for me, unless Ys VIII goes on sale, which isn't likely since it's new. Hopefully everyone else can snag some good deals, though! @tseliot Since you don't know everyone involved individually, you can't make sweeping generalizations like that and expect to be taken seriously. I'm sure it may apply to some workers, but there are so many other factors that have to be taken into consideration when understanding why people do what they do and work where they do (since jobs aren't always as easy to come by as some may believe). Or maybe I'm just delusional, what with being overcome by the smell of troll-posting and all. Not the least bit impressed with the sales so far. I don’t support amazon, especially during a workers strike. Very weak deals. Best thing I've found is a discount on an SD card. Is that for my "more complaining" post? Thanks. If you need a large memory card and $140 for the 400GB is too much then the 200GB card for $45 is a great deal. That’s tons of storage for a really great price. @FionnTheBrave I’d use the same logic on the opposite side. We shouldn’t make sweeping generalizations that the side on strike is in the right. And as boycotting is taking an action, why should we assume Amazon is in the wrong and boycott them? Because they’re a big company? Because every group of striking employees must be in a situation where they’re plight is just? There’s no reason to get consumers in other countries (where it likely doesn’t even affect that branch of the company) involved in their fight just taking their word at face value. You know, I don’t think I want to cross a picket line, but, even if I didn’t care, I wouldn’t buy anything anyways. Those “sales” that they hyped up are quite lackluster. @ShadJV That’s fair, but it’s not like Amazon is the most ethical company out there. Based on what they’ve done in the past, I’m inclined to believe the strikers. Almost missed out on that micro SD card, and it was on my wishlist. Weird that Amazon didn't drop it in my recommended deals. Sad sales for the most part, though I've been thinking about getting an echo. The discounts for amazon products are good at least, and I wouldn't buy xenoverse 2 for 30 when fighterz will be coming by years end, and the fact it was 20 bucks last black friday at walmart lol. The Power A switch case went on sale for about 21 dollars. I also ordered a couple criterion moves since they were cheaper than on barnes and noble with the extra 20 percent off. I pulled the trigger and bought that 400GB Micro SD Card. I simply couldn't refuse it at that price. Even with tax, I still saved about $100. Prime day has always been really overblown. They usually just have a couple of items that are a good deal and then everything else feels like they are just trying to get rid of inventory. @Supadav03 I am actually upgrading from my 200GB to a 400GB with the deal they have. 200GB is fine, I seem to get by, but you can get to the point where you will find yourself deleting a lot of stuff eventually so you can download new games. With the 400GB I am looking at twice the amount of space I currently have, and considering how I haven't had to delete all that much it should be a real worry free solution. Grabbed the Switch Light Up Dock Shield for the kiddo for $14.99. I just did the same myself a couple of weeks ago. I should have waited for Prime Day! I took the plunge and grabbed a 400 GB micro SD. My 200 has about 113 left on it, and I'm going to be using a lot more of that. Smash alone is gonna use 16. I prefer having games like that downloaded so I can play them anytime. @JayJ Same here! Going from 200 to 400. Picked up a 128 Gb memory card for $26. This will definitely hold me for awhile! Also picked up Lego Incredibles for $30.. can’t resist a Lego game. I nabbed a 400gb micro for my switch. Going to use my current micro SD from my switch in the new 3ds xl super nes edition I also nabbed.